Thomas "Tommy" Makem (4 November 1932 – 1 August 2007) was an internationally celebrated Irish folk musician, artist, poet and storyteller. 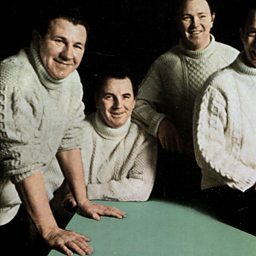 He was best known as a member of the Clancy Brothers and Tommy Makem. He played the long-necked 5-string banjo, tin whistle, low whistle, guitar, bodhrán and bagpipes, and sang in a distinctive baritone. He was sometimes known as "The Bard of Armagh" (taken from a traditional song of the same name) and "The Godfather of Irish Music".